There is nothing like a grilled steak or other beast off the charcoal during these hot summer days. After lots of Rose’ and white wine, it’s time for a taste of red. Fire up the grill, add a little BBQ rub to those thick ribeyes and enjoy any of these three wines. Here are three diverse choices with Argentinian Malbec, Australian Cabernet, and a wonderful red blend from Washington state all making the grade. Zuccardi Serie A 2011 Malbec – There are a lot of so-so and uninteresting Malbecs on the market – but even those are good QPR (quality to price ratio) wines. The Zuccardi really delivers big dark fruit, some will argue a little over-ripe or jammy, but the finish had enough tannin to cut through the fat of the ribeye. The silky mouth feel and lighter tannins make a great steak pairing. The winemaker ages 70 percent of the juice in oak. It comes in at 14 percent alcohol. This wine earned 90 points from Robert Parker. Zuccardi Serie A 2011 Malbec, online at $12-$20, widely available, Highly Recommended. Chateau Tanunda Grand Barossa Cabernet Sauvignon – Like many Americans I haven’t been drinking much Australian wine in recent years. Much has been written about the decline of Australian imports. Fingers are often pointed at the critter wines which brought Australian wine to prominence but were of lesser quality. So I was prepared for a so-so Cabernet and found myself pleasantly surprised and pleased with the Tanunda Cab. The winery dates back into the late 1800s and the nice balance of this wine suggests a long tradition of winemaking. The grapes are a blend from several vineyards in the Barossa region. Once into the winery the wine is aged 16 month in oak for a big structure and body that holds up great for any grilled beast. Ratings from Australian reviews put the wine at 89 points, and I’d say that’s about right. Chateau Tanunda Grand Barossa Cabernet Sauvignon, $17 average online price, Trade Sample, Recommended for the price point. Powers 2010 Spectrum – I liked all three of these reds alot. The Spectrum was my choice of the three though. It’s big enough to please regular wine drinkers, rounded enough for wine novices, and pairs great with about any dish. The blend is 39 percent Merlot, 33 percent Syrah, 22 percent Malbec, 6 percent Cabernet Sauvignon. Rich red fruit and a hint of herbs makes this a great drinking wine. It’s oaked in a combination of new and neutral wooden barrels. It registers in with 14.5 percent alcohol but didn’t taste hot on the palate at all. Powers has a very nice line of wines. They have been a leader in organic and low-impact farming. Powers 2010 Spectrum, $10-$13 online, Highly Recommended. As we delight in warmer springs, stay surprised by drier winters, and brace for blistering summer, it makes one wonder what we’re doing to Mother Earth! Earth Day, celebrated on this date annually, is a time to reflect and think about the products we eat and drink and how they’re produced. After attending in January the Millesime Bio in Montpellier, France, I’ve become a fan. I’m not a fanatic but a big fan of the wines, the Languedoc, and the importance of buying food products – and wine – from producers who care about what they’re doing to their soils, steams, and air. Organic wine does not use chemicals – pretty simple isn’t it? You can find organic wines in the U.S., mostly from California along with biodynamic wines. In your wine shop you might have to make an effort to find a bottle. Too often the organic wines are stuffed in a corner with Kosher wines, state wines, and “other” bottles. French wines are labeled “made with organic grapes.” The French do add minimum sulfites while U.S. producers do not. That is a discussion for another time and you can read more about it in the story I wrote for Palate Press after returning from France. But for today think about organic wines. Try a few. If you have trouble finding them then I’ll direct you to my friend Veronique Raskin’s wonderful The Organic Wine Company website. The Bousquette, Mas Janiny, and Ventoux wines are a great starting point. Keep your eye open for wines imported by Paul Chartrand, also a friend, and one of the leading organic wine importers in the U.S. Frankly, I’d challenge you to set up a blind tasting and see if you or your friends can taste any difference. Most organic wines are wonderful. And, they’re wonderful for Mother Earth. Telling a kid to eat something because it’s good for them is usually a good way to make sure it never passes their lips. At the same time, if you suggest trying something that is good for an adult and/or the environment many will assume it must be tasteless or an inferior product. A January trip to Southern France to the Millesime Bio organic wine trade show proved nothing could be further from the truth. Organic wine is a growing movement stifled by regulation, misunderstanding, and greed. The story begins in the 1980s when wine labeling laws were enacted in 1987 requiring “sulfites added” be printed on wine labels. The organic wine movement started largely in the early 1980s. The two have been linked ever since. Simply put, there is no relationship. Sulfites are used in wine to fight bacteria or fungi which can occur in the winery or winemaking process. There are all sorts of old housewife tales and stories about the ills of sulfites in food. But the facts are there are hundreds of packaged foods in your kitchen right now which probably contain sulfites. Wineries have to put a label on the bottle that proclaims sulfites, most products do not. The profiteering and greed started in the U.S. when some wineries, which had previously worked toward organic standards in the late 1980s and early 90s, realized there was a profit to be made if they insisted organic wine contain no added sulfites. The argument goes that would keep big wineries out of the business. Wines without added sulfties have a very short shelf life and are often very thin wines. European standards allow mimimum sulfites which makes for better wine that can be aged. By comparison, the U.S. law allows no more than 10 parts per million in sulfites. EU regulations permit 100 ppm. Wines that aren’t organically produce may have up to 350 ppm. So European Union wines must be labeled “made from organic grapes” to be sold in the U.S.
French winemakers claim opponents of changing the U.S. standards are merely protecting market. Most aren’t afraid to name specific wineries and individuals. But they have become frustrated and even dismissive in recent years while suggesting consumers should focus on the benefits of wines made organically. Essentially, the definition of organic wines should be wines that have no chemicals added – no pesticides, fertilizers, herbicides, or other chemicals in the winemaking process. Such practices are better for the farmer, consumers, and for Mother Earth. The concept enjoys more widespread acceptance in Europe than the U.S.
Theirry Julien, president of Southern France’s organic wine growing association, outlines a progression that happens with organic products. He also makes an interesting comparison. European consumers think about what is good for their health while U.S. consumers seem more motivated by what’s good for the environment. The Millesime Bio featured 587 wineries from 13 different countries. I probably tasted close to 300 wines in a five-day period. I don’t think any average consumer would know they were tasting “organic wines.” While there were a few sub-par bottles, I’d say more than 90 percent of the wines were good to outstanding. Southern France’s Languedoc-Roussillon region is France’s biggest organic region. The red wines are most often blends of Syrah, Grenache, and Carignan. They are tremendous table wines and great values at prices usually at $10-$20 a bottle. I wrote a more detailed story for Palate Press – The National Online Wine Magazine on organic wines and the fight over the details. Go to palatepress.com and search organic wine or my name to find that story. Howard’s Picks: Labels to look for include Italy’s Perlage, Domaine Joly (which will soon be available) or check out The Organic Wine Company online for a wide selection of organic wines. 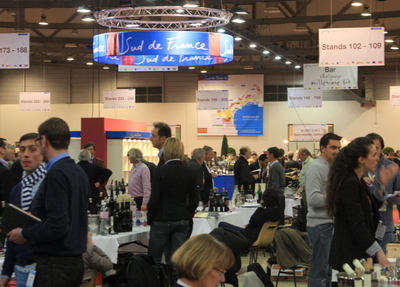 MONTPELLIER, FRANCE – There are 587 wineries from around the world participating in the 19th Millesime Bio here and there seems to be just as many stories. Men of 70 and 80 years old with domaine and chateau names which just sound historic are plentiful. But you also see the young guns. There are a substantial number of 30-something and even 20-something year old winemakers. Some are following in their father’s footsteps while others sought out the life of vineyard work and winemaking on their own. 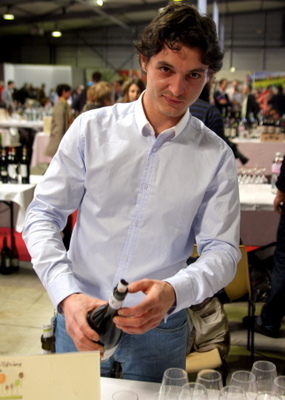 Cyril Bonnet is a very young winemaker with a very long history. He is the seventh generation to make wine. Most of that history is in Champagne where his father and family still live making the iconic bubbly at Chateau Bonnet-Ponson. But Cyril wanted to go out on his own and now has Chateau Bonnet in Villaudric, just northwest of Toulouse. Bonnet is one of those 587 producers trying to make a name for himself. He grows an odd little variety most outside of Southwestern France have never heard of before. 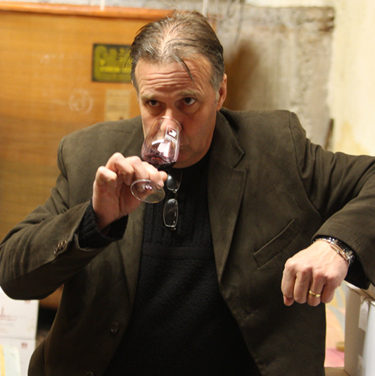 He blends Negrette with other more common varietals and even makes a 100 percent Negrette wine. Being a young winemaker at 28 with an obscure grape means marketing is important. He also is a believer in organic practices and is fully certified. “It’s very, very important, to be exported to the clients and be here at Millesime Bio,” Bonnet said. “If you can’t come to this type of fair it’s impossible to make contact to customers. My father told me this one is important because it’s very professional, very simple and we love it. The wines were interesting. I liked the Negrette grape and it definitely has a different flavor profile. The wine was light on the palate and it made for very drinkable red table wine. Bonnet is producing about 2,200 cases of wine each year. I was able to do 6 interviews and get a lot done today for future blogs, Palate Press, and the newspaper column. I am getting together with U.S. importer of organic wines Paul Chartrand, who works out of Maine, to taste our way through more wineries Wednesday. Antica Enotria – Luigi Di Tuccio was handing the pouring, sales, and marketing chores mid afternoon at his family winery’s table. He could also be described as a young guy. He was worked every aspect of the business with his father. His father was one of first in Italy’s Puglia to make the move to organics and became a leader in the region. The winery has some great varietals that aren’t household names – Nero di Troia, Aglianico and white wine grape Falanghina. His wines are available on both coasts. The family makes approximately 8,000 cases annually. Romain Bouchard – Two young brothers with no real family history in the wine business decided to buy a winery that had gone out of business in the Chablis region. They are now making two Chablis and have found some success with wines being exported to New York. Chateau de Fosse Seche – This fun young couple are making wines in trhe Loire Valley’s famed Samur region. I tasted their Samur Chenin Blanc and found it not as light as others I’d enjoyed but sure tasty. They also had a very nice Cabernet Franc. Sitios De Bodega – This started out as a case of mistaken identy. I was looking for a winery I would find later then the language barrier with a Spanish woman and my confusion gave us a laugh. I ended up tasting and liking her first vintage of Verdejo which I liked very much. Export manager Alejandra Sanz was a good sport, with pretty good English, in telling me about the new effort. Domaine de Picheral – Boxed wine in France seems a pretty ridiculous opposites attract kind of thing. But I’ve seen lots of boxed wines at the fair. I approach with my typical Tew Parl Ongleah? “Do you speak English?” to get two shaing heads and plenty of laughs for the three of us. What the heck, we used hand signals and pointing – a universal language – to taste a pretty darn good Rose, and a rather forgettable red. It was fun. 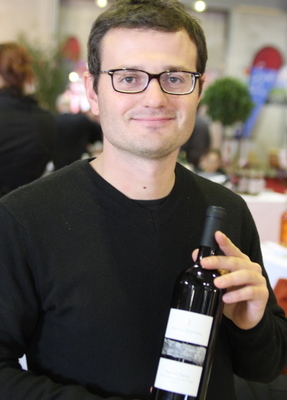 Ploder-Rosenberg – Austrian winemaker Freddy Ploder was the most congenial host of the day. The short, stout man was an enthusiastic wine tour guide through is tasting. Sharing just the right amount of wine geek talk, history, and good humor. I liked the entire line. Chardonnay, Sauvignon Blanc … with several of he wines done in different winemaking styles. As I wrote yesterday, I visited quite a few more wineries but these were the most interesting stops. And I visited several and did interviews which will turn up in future writing.